Karen Lynn Davidson is an educator, hymn writer, historian, and literary critic. She is a member of The Church of Jesus Christ of Latter-day Saints. Davidson was born in 1943 in Southern California. She earned her bachelor’s and master’s degrees in English from Brigham Young University and her PhD from the University of Southern California. She did post-doctoral research at the Cambridge University and the University of Chicago. She taught English at Mayfield Senior School in Pasedena, California, and Brigham Young University. She is coauthor of Eliza R. Snow: The Complete Poetry (with Jill Mulvay Derr). 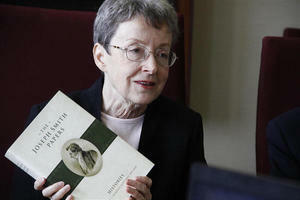 She is also a co-editor on The Joseph Smith Papers: Histories, volume 1 and 2. This page was last edited on 30 July 2014, at 15:13.